In order to analyze the impact that different data plans have on the YouTube usage of smartphone users in mobile radio networks we looked on our crowdsourced data from our US panel. The study is based on the data of about 4000 users in Verizon, AT&T, T-Mobile and Sprint. The data is taken from the time period October 2015 to mid-April 2016 while all data from T-Mobile later than 17th March 2016 was excluded as YouTube joined T-Mobiles Binge On program at that day and it is likely that this influenced the YouTube usage of T-Mobile customers. As we do not have any information about the particular data plan or tariff of a single user in our panel we approximate this by classifying the users by their monthly amount of transferred data. This can be regarded as a good approximation assuming that heavy users have a large data plan and light users have a small one and assuming that the monthly data volume is somewhat close to the maximum allowed monthly volume. Figure 1 shows the average of the monthly volume in [GB] a user spends on YouTube for all users spending a particular total volume per month. The total volume per month is binned, i.e. the users are classified according to their monthly data volume. 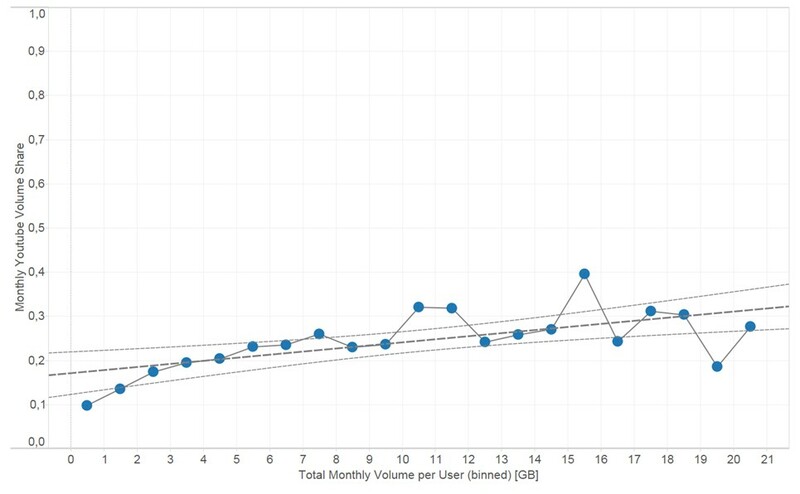 Each bin is 1GB (‘0.5GB’ total monthly volume corresponds to all users having between 0GB and 1GB of data volume). Please note that the graph has double logarithmic scales in order to emphasize the fact that there are far more users with smaller monthly data consumption. For this reason the values start fluctuating a lot for higher monthly volumes. The data volume spent on YouTube increases proportionally with the total monthly volume. For users with a data consumption of up to 7GB a month this proportion seems to be nearly linear. The proportionality is shown in more detail in Figure 2. 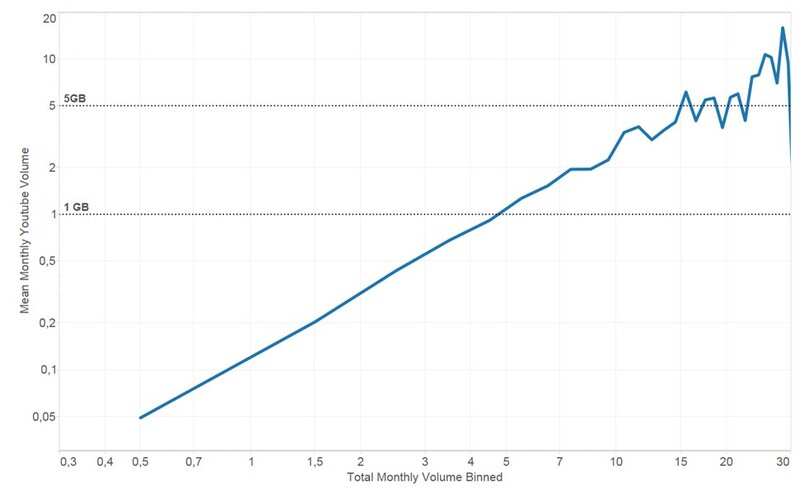 The graph shows the share of YouTube data volume on the total data volume per user per month (again the total volume is binned with 1GB steps). The portion of monthly traffic per user originating from YouTube increases from about 10% for low volume users to about 20% for users using between 3GB and 4GB of data per month. With increasing monthly data volume the YouTube share seems to increase further, though with a slower growth rate compared to the lower volume users. This analysis shows that our crowd sourcing data can in general be used to study the YouTube user behavior. A next analysis step would go into the direction of looking into each bin and analyze the variance of YouTube share within each bin and see whether the share is about constant over the whole population or if it varies. Furthermore, the analysis can be broken down into different networks and extended to other markets worldwide as carriers offer different data plans and different markets might be more sensitive to data usage than the US market.